These screensavers and wallpapers are Freeware but not Public Domain. You may link to this page, but it is PROHIBITED to direct link to the download file, or to copy these files to your server or on a CD. All files are protected by copyright and can not be sold or redistributed in any form. A cute little saver for children with The Easter Bunny and his eggs. 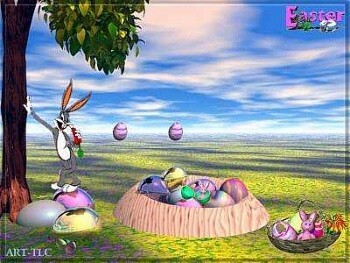 Animations of eggs float by with music. Screensaver copyright, ART-TLC ©.